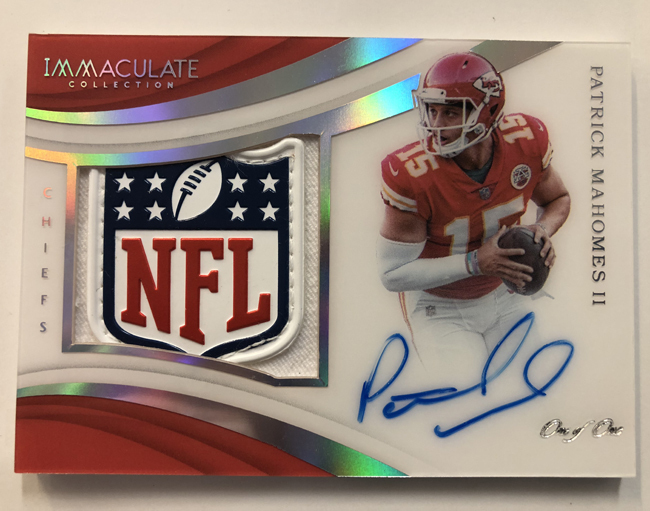 2018 Panini Immaculate NFL Football ($375 per box) is HERE at Sports Cards Plus, a.k.a. The Super Hit Factory. 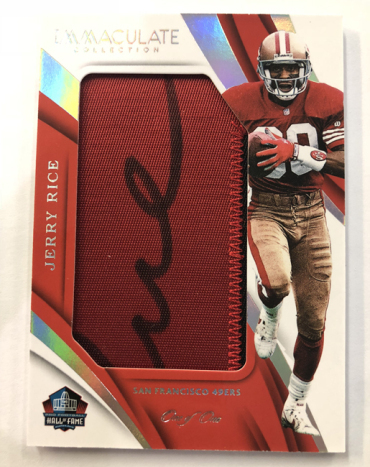 With 6 premium cards per box, 5 of which are autographs or premium memorabilia, Immaculate Football has always been a collector favorite, one that consistently delivers some of the most desirable and valuable cards in the hobby. 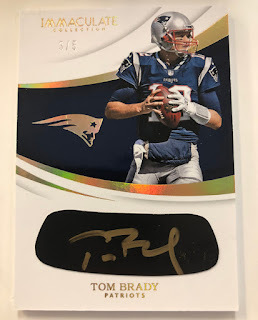 This time around, all on-card autographs are done on acetate, giving them a more distinct feel and look compared to a lot of other autographs in the highest-end products in the hobby. 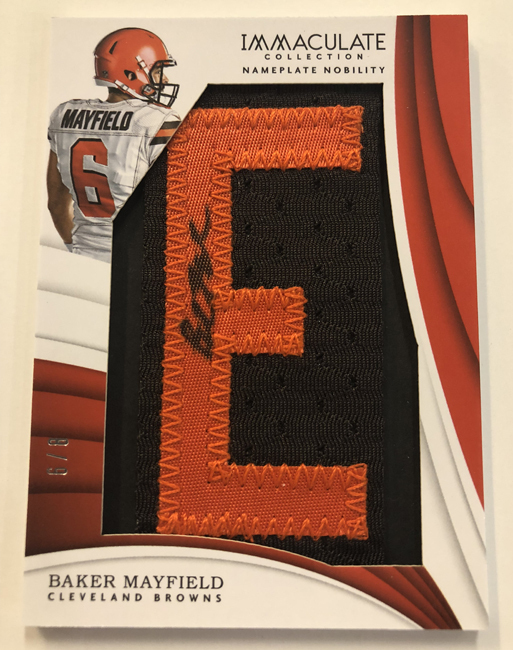 Rookie Patch Autographs (/99 or less) return with on-card signatures with a premium swatch. 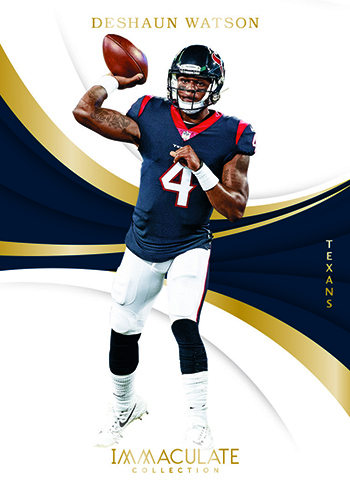 Besides Gold parallels (/25 or less), these have Platinum Tag and NFL Shield versions, each of which are one-of-ones. 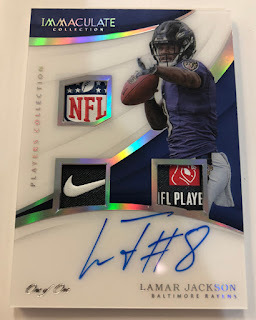 Additional on-card autographs, done on the acetate stock, come in several themes that highlight specific achievements at the game, season and career levels. These include Immaculate Moments Autographs, Immaculate Honors, Immaculate Seasons Signatures, Immaculate Records, Immaculate Careers, Immaculate Rings Signatures, and Immaculate Post Season Signatures. All of these have print runs of 25 and under. Multi-signed cards are available with two and three autographs. These are also hard-signed directly on the card. They are tough, though, with no more than ten copies each. Premium Patch Autographs (/99 or less), which are also on-card, go beyond rookies for its checklist. Parallels are similar to the Rookie Patch Autographs, coming in Gold (/10 or less), Platinum (1/1) and NFL Shield (1/1). 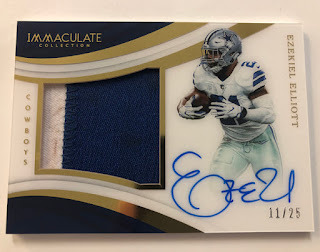 Eye Black Jerseys are new for 2018 Panini Immaculate Football. Rather than using regular stickers, autographs on these are done on pieces of eye black. Available for both rookies and vets, no more than 99 of each base version exists. Parallels are extremely tough, with all numbered to 7 or less. Memorabilia cards have always been an important part of the Immaculate line. For 2018 Panini Immaculate Football, Jersey Numbers, Team Logos and Laundry Tags all return with massive swatches. 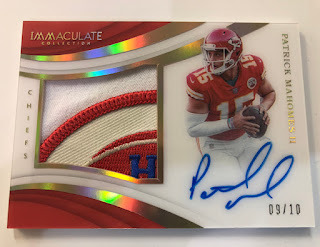 New Immaculate Shields are part of the checklist this time around as well. Immaculate HOF Jerseys (/49) take a similar approach, only with gear worn by Canton inductees. Parallels here are in Prime (/25 or less) and Platinum (1/1). 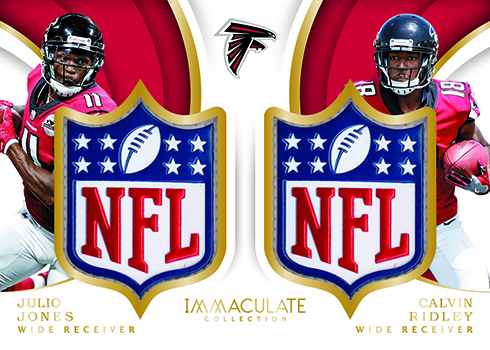 The Immaculate Dual NFL Shields checklist has 60 cards. The one-of-ones each have a full shield from two players. And of course, 2018 Panini Immaculate Football includes a main base set of 100 cards, which are numbered to 99 and have a pair of parallels: Gold (/5) and Platinum (1/1). Given that each box has one base card, no more than 10,500 boxes (1750 6-box case) have been manufactured.